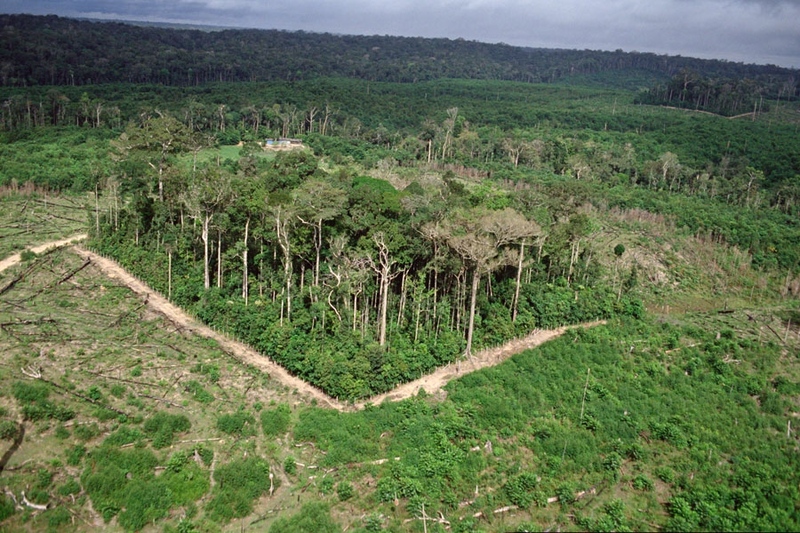 Forest fragmentation is one of the leading ways that humans alter natural habitat. Forests are frequently fragmented as land is cleared piecemeal for the expansion of agriculture, logging, and human settlement. Often, rather than clearing an entire forest, fragments of forest are left embedded in a matrix of agricultural and other habitats. As an increasing percentage of the world’s forests are fragmented, it is crucial to understand how forest fragments function. Fragments are subject to a variety of influences, most notably edge effects. Edge effects occur at the edges of two habitats, and include altered microclimate, reduced biodiversity, and vegetation changes. These edge effects can bring about altered species communities, which in turn could affect the amount of carbon that can be sequestered near forest edges. As forest fragmentation continues, a greater percentage of forest will be exposed to edge effects, potentially inhibiting forests’ ability to act as carbon sinks. To understand these effects, Ziter et al. (2014) examined how tree species composition and carbon storage capacity change with proximity to forest edge in large and small fragments. Using tree measurements and allometric data in the literature, they determined how much carbon was stored, and which species were present. Using linear mixed models and multidimensional scaling, they found that community composition shifts with proximity to the forest edge. Despite this shift, however, carbon storage did not decrease closer to the edge. Ziter et al. identified six each of small connected, small isolated, large connected, and large isolated secondary forest fragments embedded in an agricultural matrix in Quebec, Canada. Two 100 meter transects were established in each fragment, with five 10×10 meter plots per transect. In each plot, the researchers recorded the species and diameter at breast height of all stems. Using allometric equations from the literature, they determined how much carbon was stored in each plot. Linear mixed models were used to assess how proximity to the forest edge affected both species richness and carbon storage. To test community composition, they used non-metric multidimensional scaling, which compares the similarity of communities. They found no effect of any variable on carbon storage; carbon stocks remained constant over the gradient from forest edge to forest interior. However, vegetation structure and species composition was altered at the forest edge. Stem density and species richness were higher at the edge, and included more shade-intolerant species. The lack of a decline in carbon storage at the forest edge contrasts with previous studies. In tropical areas, large trees are responsible for the majority of carbon storage in a forest, but are often removed from edges by wind pressure and altered microclimate. While a similar pattern was observed in this study, increased vegetation density at the edge compensated for the reduction in large trees. In some fragments, large trees were still preserved at the edge, which is likely the result of human management for large sugar maples. This study indicates important differences between the reactions of temperate and tropical forests to fragmentation. While tropical forests are reduced in their capacity to sequester carbon, temperate forests appear to maintain full storage capacity. Thus, even small and irregularly shaped fragments may remain valuable for carbon storage in human-dominated landscapes. Carly Ziter, Andrew Gonzalez, Department of Biology, McGill University, Elena M. Bennett, Department of Natural Resource Sciences and McGill School of Environment, McGill University, Quebec, temperate forest, carbon storage, edge effects, fragmented forest, sustainability, carbon sequestration, climate change. #fragmented #temperate #forest changes community composition toward forest edge, but maintains #carbonstorage. This entry was posted in Forests, Stephen Johnson and tagged Andrew Gonzalez, Carbon Sequestration, carbon storage, Carly Ziter, Climate change, Department of Biology, Department of Natural Resource Sciences and McGill School of Environment, edge effects, Elena M. Bennett, fragmented forest, McGill University, Quebec, sustainability, temperate forest by Emil Morhardt. Bookmark the permalink.